When dancers hit the dance floor, they bust a move. And if they are a good dancer, they have good moves. The same is true for athletes. When basketball players hit the court, they make moves. They spin, shake, shuffle, crossover, etc. with the intention of scoring. If they are a good player, they will have good moves. In fact, sometimes members of the media will even describe an especially good player as having “an arsenal of moves.” Isn’t that a vivid description of the potency of that player? An arsenal of moves. My experience in studying good teammates has shown me that these individuals have an arsenal of moves of their own—a seemingly endless supply of selfless acts that benefit the other members of their team and their team as a whole. I have come to know these acts as good teammate moves. If you walk down the hallway of your building and see a piece of trash, and then—without hesitation—proceed to pick up that trash and throw it in the trashcan, you are making a good teammate move. You don’t grumble about who threw it there, or whose job it is to pick it up, or how terrible it is that you had to be the one to pick it up. You just act. If you walk through the parking lot at your grocery store and see a stray cart, and then—without hesitation—proceed to push that cart back into the store, you are making a good teammate move. You don’t grumble about who left it there, or whose job it is to push it back, or how terrible it is that you had to be the one to push it back. You just act. You do these things because they are what’s best for your team. In the case of the loose shopping cart, you push it back into the store because the cart could cause damage if it rolls free and smashes into someone’s car. Those “someones” live in your community and are your teammates. The citizens of successful communities act and see themselves as teammates. Your small gesture of kindness—pushing the cart back into the store—benefited your community. You may have kept someone’s car from being damaged. You may have helped the store keep its prices down. You may have reduced insurance premiums. Interestingly, your action didn’t really cost you anything extra at all, except maybe a little bit of time and effort. But it potentially made a big difference to your team. Did you make any good teammate moves today? As any parent will attest, it is a challenge to get your children to provide details about their day. But asking them the same three question everyday seems to give them some routine in terms of what to expect when they get home. It also seems to have increased their willingness to disclose more information to me than I otherwise would have been able to obtain. My first two questions are actually just set-up questions. They prime the communication pump, so to speak. I am more interested with their answers to the third question. 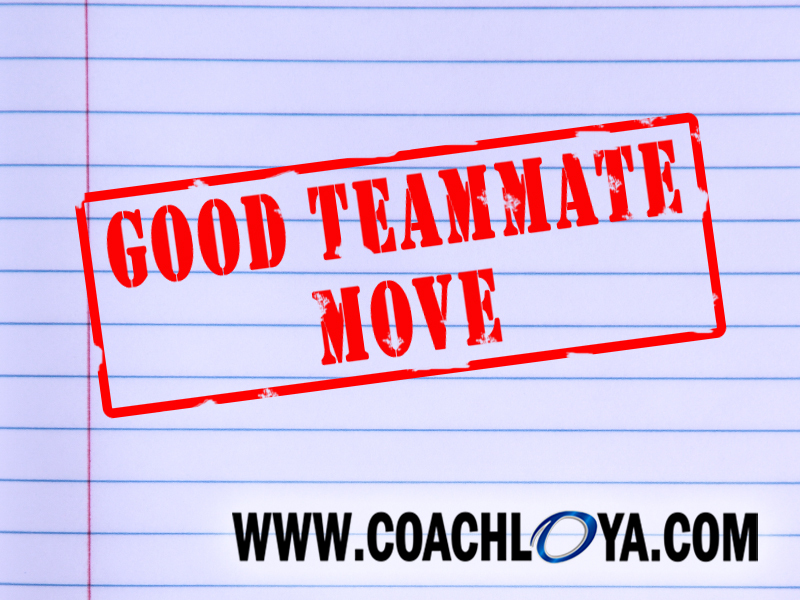 Did you make any good teammate moves today? I am consistently blown away by their answers. Some days it’s hard to fight back tears of pride, because I am so touched by what they tell me. Not long ago, my daughter told me the story of how she won a spelling contest and got to pick a prize form the treasure chest. She told me how there is girl in her class who never has crayons of her own and always has to share the other kids’ crayons. My daughter chose a box of crayons as her prize and then gave that box to the little girl who didn’t have any of her own. Another time, my daughter told me how she left her normal group of friends to go play with the new kid in her class on the playground. Who wouldn’t want to be teammates with someone who thinks this way? How about friends, neighbors, or colleagues? I think everybody would. It doesn’t take any special talent to make good teammate moves. You just need an open heart, a generous spirit, and a willingness to not mind being inconvenienced by going above and beyond. We are all capable of having those things. And we are all capable of being a good teammate. All it takes is a simple shift in mindset. What good teammate moves can you make today?